Hello to all,not sure if this is the correct avenue to go down but will ask .I am seeking a copy of what I presume will be family memoirs written by Mrs JR Mather (nee Forster).She was Ethel Ada Sarah Forster (sometime Foster) and the family lived opposite the Bedlington Iron Works in Rose Cottage.I will be visiting Bedlington in May so if someone knows of a copy, perhaps in a local library or such, that I could access that would be tremendous. @Lee Foster if you input "Rose cottage" (with the double quotes) there is a mention of the memoirs in a topic raised by @johndawsonjune1955 . I don't know if John has a copy or knows where to find one. I have seen a couple of facebook postings, with photos, on the Bedlington groups claiming to be Rose Cottage. At the moment I don't have access to them but other members will have. When I get the chance to contact John Dawson I will ask him what info he has and update you but he may read this and comment himself. Think i posted the full story ? Thanks @johndawsonjune1955. Do you know if there any relatives of the Foster family still in the area that would know if there is a copy of the memoirs available to the general public? @Lee Foster - this postcard has been posted a few times on the Bedlington & sixtownships (now called Past Times) Facebook group. 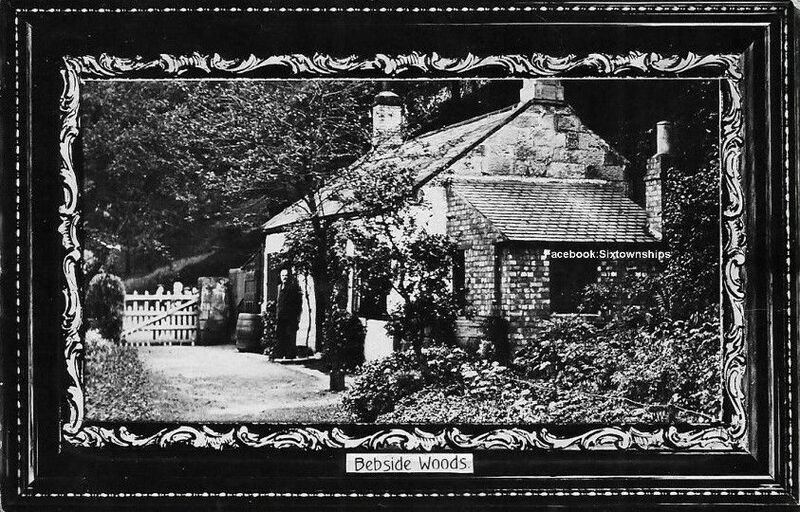 It has been posted under the name Rose Cottage and the Toll House on the Bebside of the river Blyth at the entrance to the H'appeny woods. None of the members that have posted the photo have named the man standing at the door of the cottage. Hi Lee & Eggy, I think I can throw some light on Rose Cottage. The house on the postcard is definitely not Rose Cottage. It’s more likely to be the Gate House. It is the house with the hip roof to the far right of the picture – not the dilapidated house with the cross gabled roof. We know it better today as Clock House and here’s a picture of the same two houses taken, I believe, in 1899. You can also find it in the gallery (Thanks to Foxy). The house on the left is Rose Cottage. It no longer exists but the stone plaque above the door was built into the bandstand in the adjacent park. I believe there’s also a photo of this in the gallery. 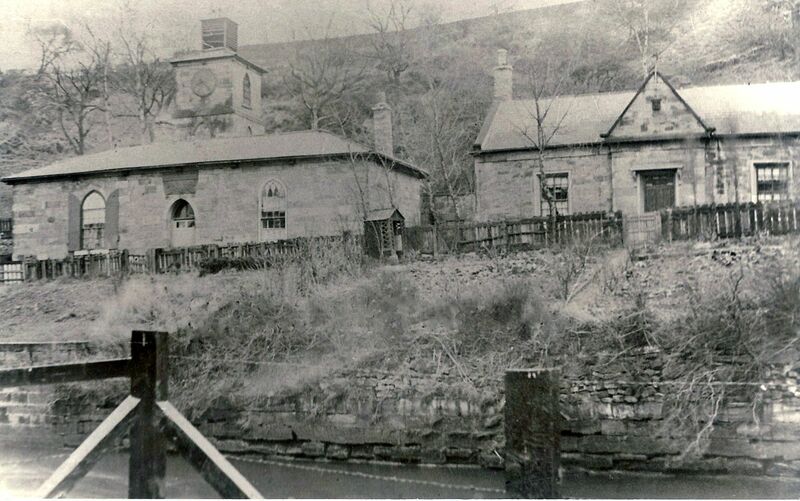 Rose cottage was formerly one of the buildings belonging to the Ironworks, which was active until 1867. I don’t know what it had for use in the company but it’s quite stylish with its arched windows and stone plaque above the door. Possibly a home for a manager or company offices? Before the company ceased production in 1867, around 1850, a housing community had developed around the coal mine at Bebside. This community expanded rapidly as more and more miners were needed to provide more and more coal to fuel the ongoing industrial revolution. 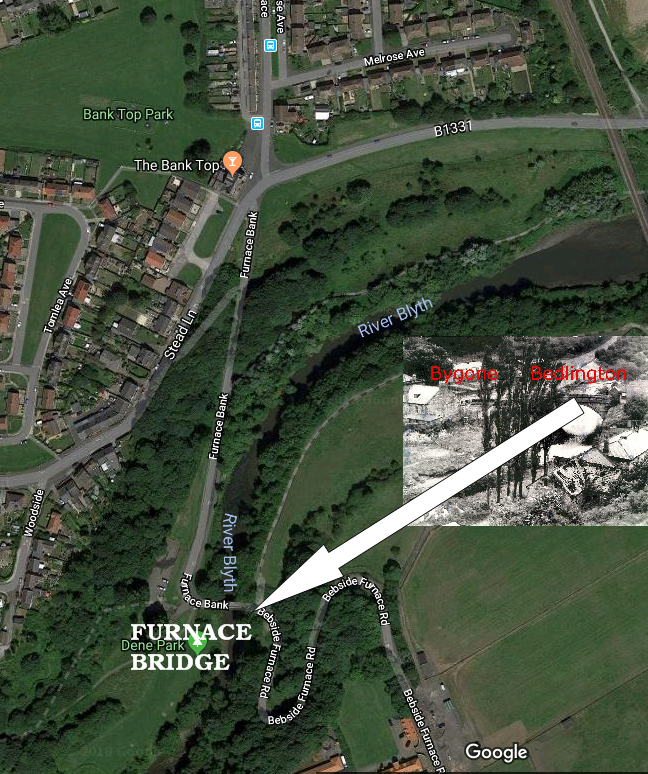 Eventually, land for building began to be scarce and a new community was started – intentionally or otherwise – a half mile down the hill and heading north on the road leading to Bedlington Station and flanking the south bank of the River Blyth. 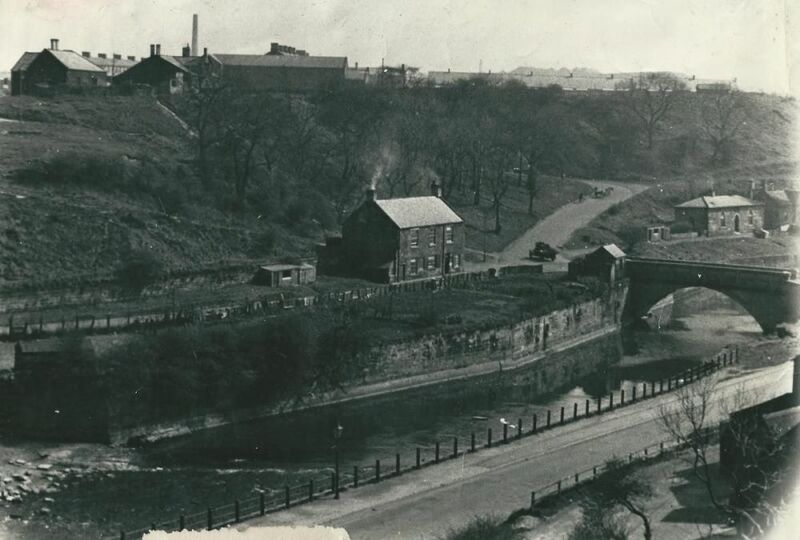 The area was formerly occupied by the ironworks. This community became known as Bebside Furnace to distinguish it from the community known as Bebside at the top of the hill. Eventually the buildings from the ironworks, first the worker’s houses and later the factory buildings, were also taken into use as dwellings for miners. This can be seen very clearly in the street names: Old Gate Row, Old Factory, Factory Yard and Clock House all of which are included in the 1911 census for the area. In the following photo you can see Rose Cottage to the right at the bottom of the hill leading down from Bebside and beside the river. Rose cottage appears to have changed its name to Clock House around 1911. I know it was called Clock House in the early 1930s because my parents lived there (before I was born) and two of my siblings were born in that house. One of them even died in that house at the age of 3 months. Hard times! 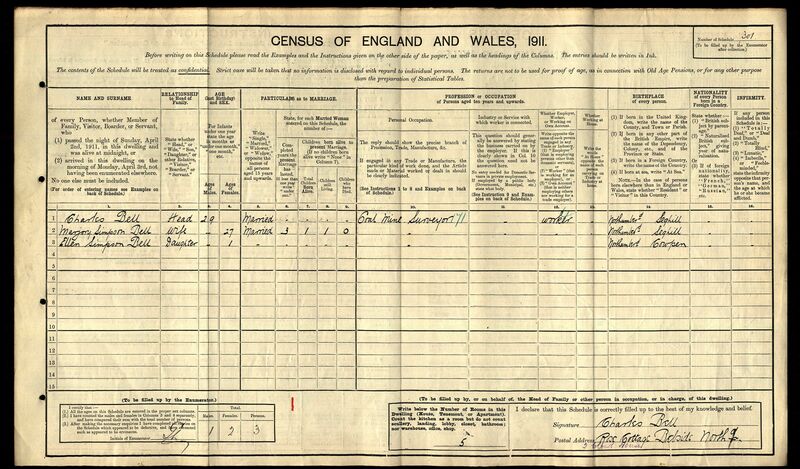 The reason I believe the name change came around 1911 is because of an entry in the 1911 census. 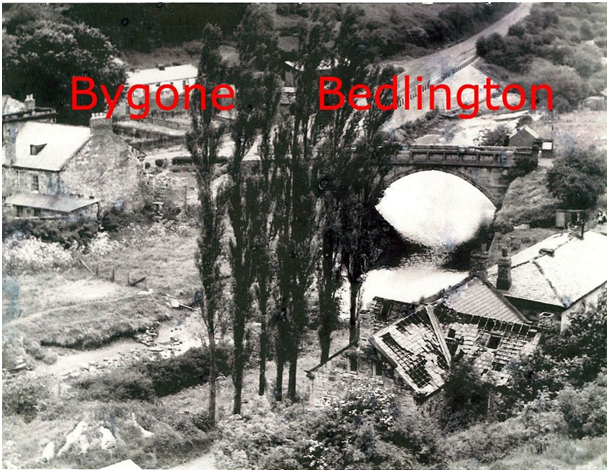 At that time the community of Bebside Furnace belonged not to Bedlington but to Bebside and Cowpen (despite the name ‘Bedlington Ironworks’). I don’t know if you are familiar with the census enumeration system in Britain, Lee, but it follows very strict procedures and routes. If you are ‘au fait’ with these procedures you can follow the footsteps of the enumerator from house to house as he delivered, and later collected, the census forms. I did this earlier. Starting at the top of the hill on Brick Row (the leftmost row of chimneys in the above photo) I followed his steps down to Bebside Furnace passing Doctor’s Row (formerly Gate House), through Bebside Furnace Gardens (Market Gardens), past the 25 houses of Old gate Row (formerly Gate Cottages) and on to the eight houses of Old Factory (named’ Factory Yard’ by one resident). Coming down the hill I reached Clock House. There I found the 29 year old Coal Mine Surveyor, Charles Bell his wife and one year old daughter living at number two – the very house/apartment in which my parents lived. Turn the page and we can see the information given by the head of the household, Charles Bell. Charles gives his address (bottom right) as “Rose Cottage” leading me to believe that this is the name he is using at the time. This isn’t uncommon throughout the Bebside Furnace area. All the “formerly” called street names I mention above are those given by the residents. The enumerator gives another name. 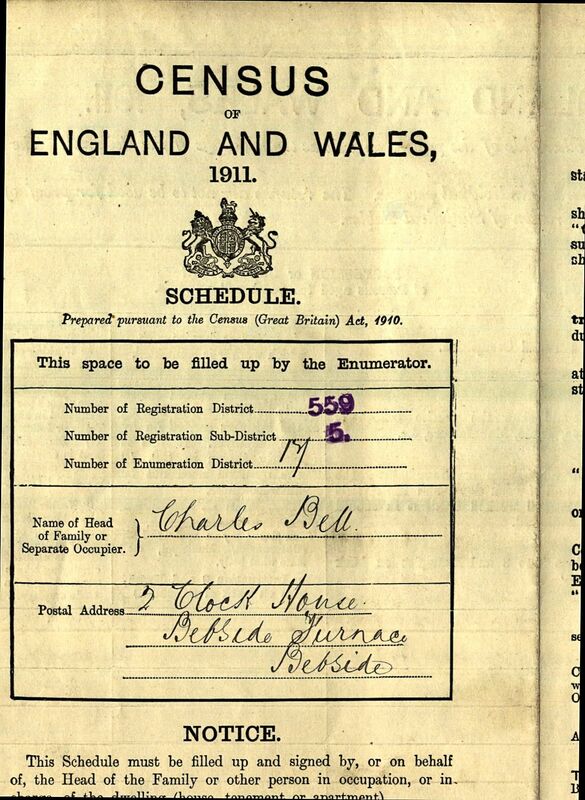 The quality of this last photo isn’t too good but if you look closely you can see that the enumerator has written “2 Clock House” in small letters below Charles Bell’s “Rose Cottage”. 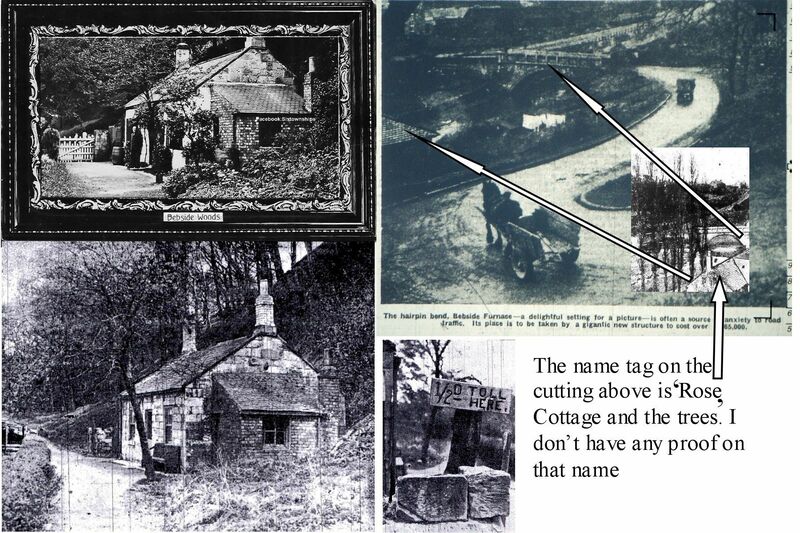 I hope this brings some clarification to the mystery of Rose Cottage. By the way, Lee, I am looking for a Forster (with ‘r’) in my past. My maternal grandfather, born around 1875 and also from this area, was given a middle name – Forster. I’m guessing it may be from a former family member – possibly one who married into the family. I understand it was a common practice then. 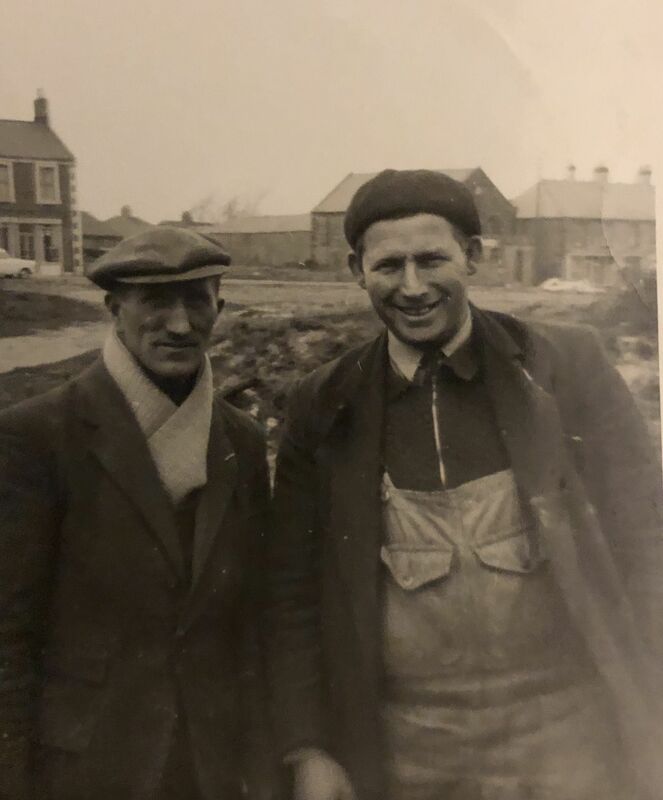 Hi to Alan and Canny Lass, thankyou both for taking the time to enlighten me .Alan I have blown the photo up but the person does not seem to match the one I have of Joseph Foster. When he lived in Rose cottage he would of course been much younger ,but that I guess is further proof that perhaps that Rose cottage is not our Rose Cottage also the hill behind which I think does not match the area.. Canny Lass, well that is a whole lot of information which I shall have to read a couple of times to fully digest. Of interest here is Joseph Forster's 1901 census. Leading up to his entry we have Old Factory Yard, Old office, Rose and Crown Inn,Rose and Crown Row, Bridge End House, Bebside Gardens, Clock Tower and Rose Cottage with Joseph and family listed as residing in. Could it be that the cross gabled house is in fact Rose Cottage and that "Clock Tower" as it is called here is in fact Clock House. Interestingly Clock Tower lists two families schdl 309 Robson family and 310 as Short family then Rose Cottage schdl 311.I think perhaps that because the poplar trees are behind the cross gabled house this perhaps further points to it being "Rose Cottage" It will be interesting to see what you think . It is so interesting I am very much looking forward to walking this area and getting the "feel" for that patch of ground..As regards your Forster, he could well be one of my family ,they chopped and changed so often I doubt they knew who was who. My grandfather Joseph Foster changed a couple of times to Forster but used Foster only when he settled in Australia Some of his siblings continued with Forster and some used Foster.it may have been a bone of contention within the family as their father had in the course of his life also changed from census to census. If I can help you with any info re your "Forster" would love to help. Cheers and thanks once more for your help. Oops should have gone to spec savers. The picture above needs to be labelled BUDC possibly taken in the sixties. i hope someone can move the post to a relevant thread. Sorry not a lot of time. Could it be Netherton Lane?